Neat poem, I can relate. The Monarch is kind of uncommon, I have never run across one in the wild. The bell problem probably means that the clapper is continuing to touch the bell after it hits it. You can probably bend the clapper slightly so that it hits the bell and then stops touching it, letting it ring out. I've tried a few things with the bell, loosening and tightening the bell itself didn't help. Good theory on the clapper. I will try it. I have noticed that the Monarch isn't common which might be another reason I have decided I probably won't part with it. It looks like an identical machine was sold as a later Quiet-Riter. I bought it for $8 so it's hard to complain when it works as well as it does (it needed a little cleaning of course). 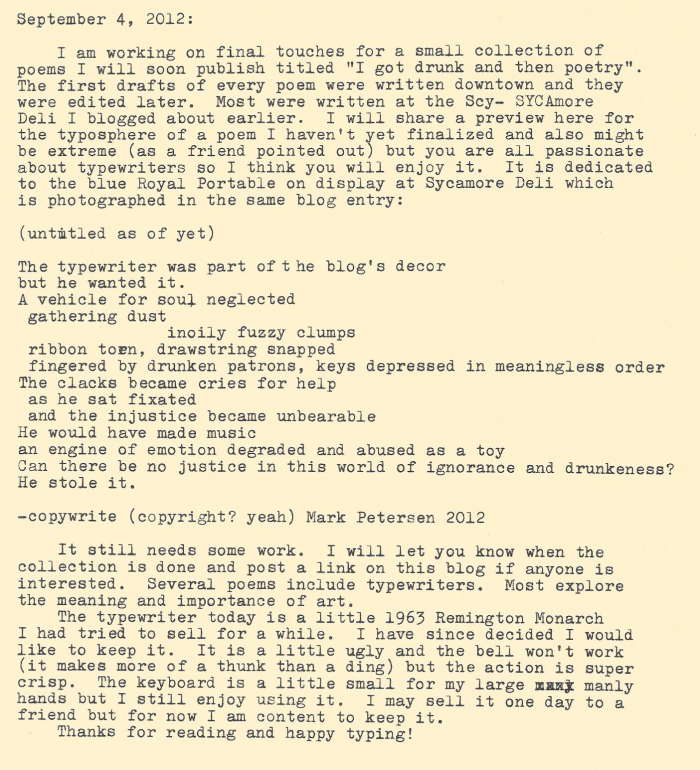 Is this about you stealing a typewriter from that lovely bar you attend? For shame! Then again, good for you! Haha. I don't really get poetry, but anything with typewriters interests me. Thanks so much for sharing. I am definitely interested in the release of the rest of the work. I didn't steal it, it's still there. I wanted to though, I still want to, but I would never do such a thing. "The clacks became cries for help..."
Loved the 'He stole it.' ending! I can relate with 'The clacks became cries for help'; my Remington had obviously been played with before I came along and rescued it. I'm actually going to be writing a collection of stories from its point of view. Im not sure wether I'll turn it into a blog or an ebook, yet. Looking foreward to your finished collection of poetry! My mom used to have this typewriter, and she handed it down to me around 1976ish. Same exact color and configuration. Like a dumbass I landfilled it when I bought an electric typewriter in 1987 that could make easy corrections. Just chucked it in the dumpster. 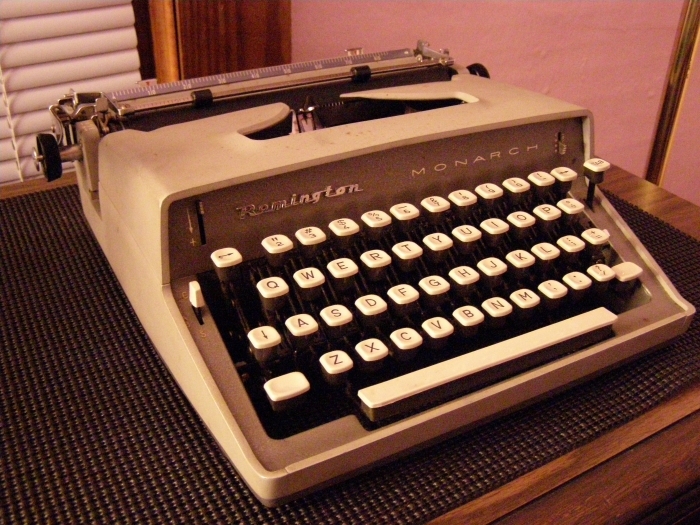 The Remington Monarch wasn't the greatest of typewriters, but I wish I would have kept it for sentimental reasons. My mom was an amazing typist. She banged away at around 50 wpm with Zero mistakes. I used to have her type up my essays and she never had to stop and make a typo correction. I'm a fast typist, but I still make 4 or 5 mistakes on a typical page.